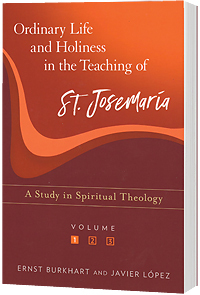 This first of a three-volume spiritual theology provides a deeper, enriched presentation of the teaching of St. Josemaría on the vocation to holiness in ordinary life, as lived out by lay faithful and secular clergy. The introduction provides an historical and theological context for the three parts of this first volume. The first part deals with the ultimate end of Christian life, the second part develops the subject of the Christian as a free child of God, and the third part explains the spiritual means to use in order to reach our end in God. Indexed and with extensive new quotations from the writings of St. Josemaría Escrivá. The present work, in three volumes, is the first attempt to gather together systematically the whole of St. Josemaría’s message about the sanctification of professional work and all daily life.